The biggest supermassive black hole was recently discovered by astronomers thus far. Using the Hobby-Eberly Telescope at The University of Texas at Austin’s McDonald Observatory astronomers have discovered this beast, located in the constellation Perseus, to have a mass of 17 billion solar masses! A solar mass is the mass of our own Sun. So you can almost imagine how dense and heavy this supermassive black hole is. Now what makes this even more unusual is how much of the galaxies mass it has inside. Now to give you a little context astronomers have only measured the weight of about 100 or less black holes. So that data isn’t exactly all there but what the norm has been is that a typical black hole usually consists of 0.1% of a galaxy’s mass. However this behemoth has 14% of it’s galaxy’s mass! You can imagine how extreme of a case this is for astronomers and how this raises more questions about black holes. 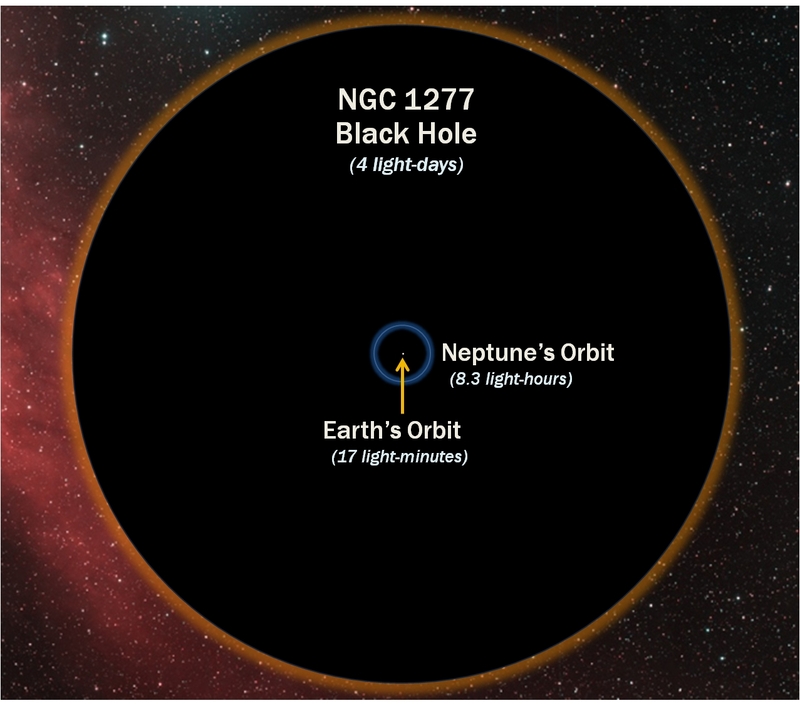 Here’s a great photo of how big this black hole is in relation to the orbit of Earth and neptune. Now remember that the radius of Earth’s orbit is 144,000,000 KM away. Not too much perspective but just to give you a starting point. Of course we can multiply that by 2 and get the diameter of the orbit. It also takes around 8 minutes or so to travel at the speed of light to get to the Sun from Earth. So it takes about 17 light minutes to get across the whole diameter of the orbit.